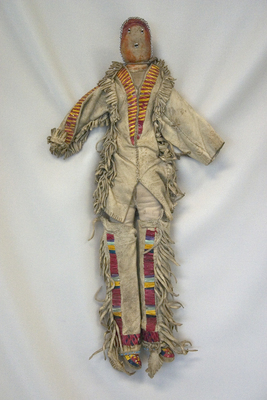 The doll was recovered from a box of objects that was almost discarded at UND as explained in the following story by Merry Claymore Ketterling, former UND American Indian Department secretary: One day I got a call from a friend who worked in the warehouse at the University. She told me about a box of Native American things …. When I opened the box, to my surprise, I saw quillwork I knew was old because it was dyed with natural colors…. My favorite piece is the doll. I remember my grandma had a doll like that, but she probably sold it because we were so poor.… Because we needed money, our families rarely kept objects like these. Having these items here at the University for people to see, reinforces that we Native people are still here in the Dakotas. Our culture and traditions are still alive!